My sister just came back from Korea. As usual we waited to see what she has bought for us. 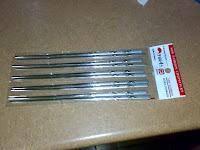 Since I got a new place she bought me 4 pairs of Korean chopsticks. So only 3 people can come over at a time at my place. It was quite nice chopsticks. But what did she get for her percious Jake. She bought him a shirt. 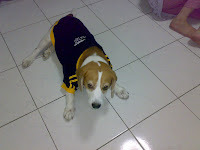 He look so cute in it. Yes yes.. after I made him put on the shirt I did bring him for a car ride. Better than some ppl who made him put on and never bring him any where. *sigh* *sigh*... Went to our favourite Ikea shop last night. And guess what I saw.. 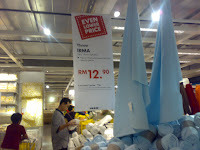 The blanket that I paid RM 15 is now down to 12.95 or something like that. *sigh*.. Oh well.. I take comfort in the fact that the blanket made Li Mae warmed a few days earlier. AND THEN.. I found out the BED that I wanted to buy went up in price. 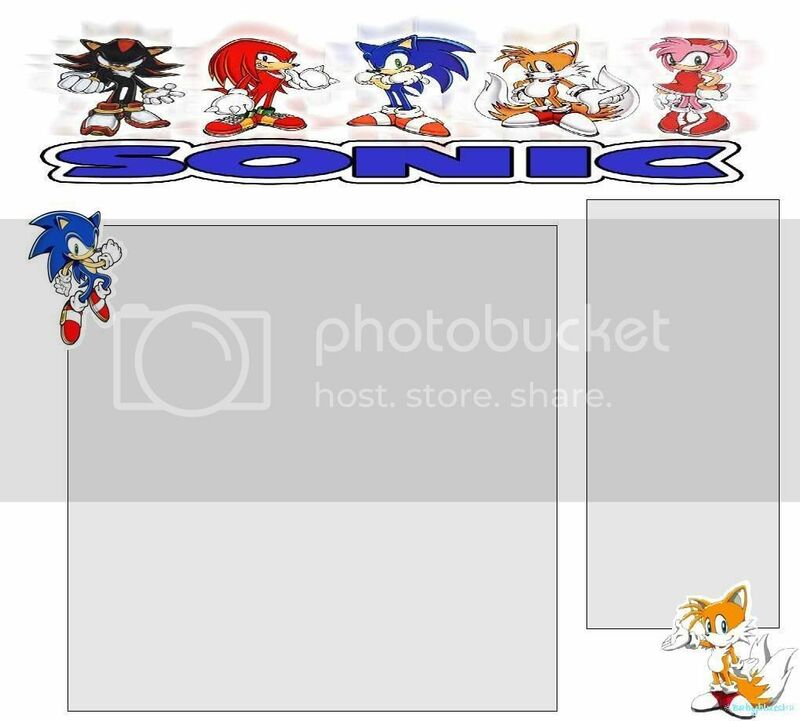 *sob* *Sob*.. I tell you sometimes the difference in a fews can make or break you or rather your budget. 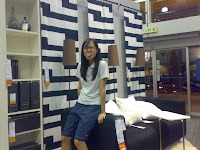 But then Ikea is still one of my fav places.. so... what else can I say. Since I have settle most of kitchen it time to decide on the bed for my place. As usual the 1st place I thought of was Ikea. 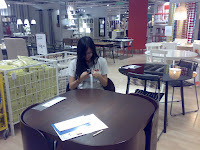 I was at Ikea almost every day of this week. on 31st, after much waiting around a TTDI house. 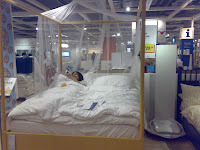 I finally managed to get one of my bed tester to come to Ikea with me. Of course her objective was to ensure that I get a nice bed for her. 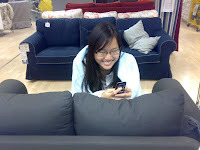 We reach Ikea around 10 pm. At 1st we were quite happy we thought they close at 1 am. At the entrance I made a comment that some people actually sit on the spinning display at the entrance. I made a mistake by making that comment, so the next thing I know... someone got on the spinning display. I try to pretend I didn't know her. Next we went to look at sofa. That when my tester went to work. Testing the sofa. Actualy she didn't really go to work there coz she was more interested in smsing.. her sidekick. I think she is smsing her sidekick coz over the weekend we only had lemmonhead alone. After sofa was the dinning ad living room section. Then the real bed testing.. 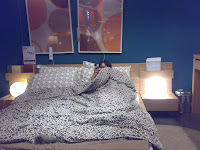 I think if the people didn't chase us out she would have slept in Ikea. 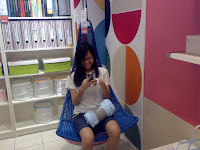 And you notice something from all this photo is that Li Mae can't live without her phone.